An obelisk commemorates 10 servicemen from the district who died or were killed in World War One. 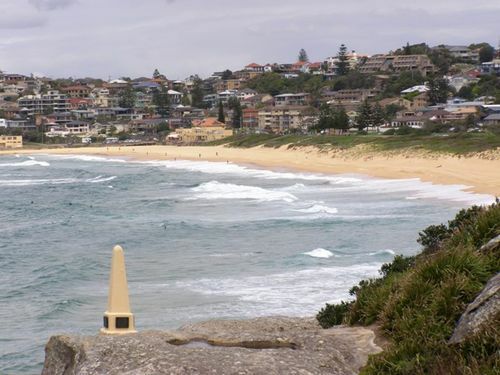 This monument was erected at Dee Why Head, Brookvale Reach, in memory of soldiers killed at the war who had previously been known on the beach, by Mr. C. G. Martin, who designed and made the marble tablet, assisted by Mr Robertson (known as Unk), and several other surfers of Curl Curl. The monument has been built of concrete, and stands on a large rock base above sea-level, overlooking the spot where these boys used to spend their week-ends. The cement for the monument was carried from Manly, round the beach, by Mr. C. G. Martin and others, two or three miles, that being the only means of getting it to the site. The monument can be seen from the open sea by passing ships, as it stands out boldly on the cliff. The work was done by purely amateur labor, and was all voluntary. Sun (Sydney), 12 May 1918. The obelisk was placed on the clifftop in 1917. On the granite tablets are listed Australia soldiers killed during W.W.I. They camped at North Curl Curl Beach in the years prior to 1914.